We celebrated a birthday at our house on Sunday – BeeBop’s! Whenever a birthday is approaching, I usually ask the honoree what they’d like for me to cook especially for them and what kind of celebratory cake they’d like. Usually, BeeBop chooses a German Chocolate Cake or my great-great grandmother’s Lemon Cheese Cake. But, this year he wanted a repeat of this one that I tried during the Christmas holidays. 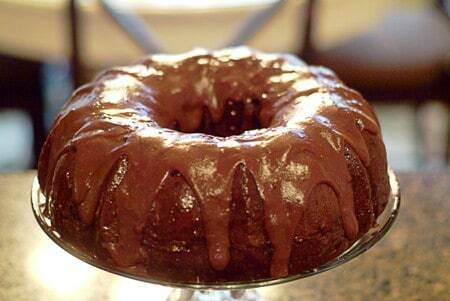 It’s a devil’s food chocolate bundt cake with a raspberry glaze and a chocolate icing. Oh. Yum. Still with me? Great…let’s get going. 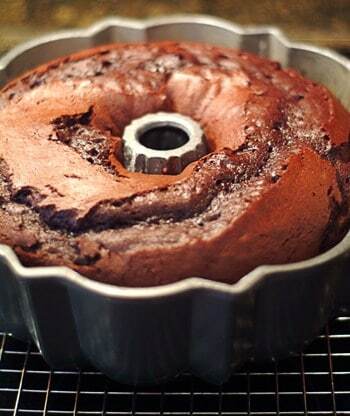 Before you begin, grease and flour a bundt or other tube pan. Set it aside. In a large bowl, combine the first seven ingredients. Literally, just dump them all in the bowl together and let your mixer do the work. Beat on low speed for 30 seconds then increase the mixer speed to medium and continue beating for 2 minutes until the batter is smooth and creamy looking. Gently stir in the chocolate chips. Pour the batter into your greased and floured pan. Bake for 45-50 minutes or until a tester inserted near the center comes out clean. Cool the cake in the pan for 10 minutes. And don’t worry about cracks in the top of the cake, that’s normal. Besides the cracks will be on the bottom anyway when you invert the cake for glazing and icing. After ten minutes, turn the cake out on a wire rack to cool completely. It’s important for the cake to be completely cool before continuing with the glaze and icing. In a small saucepan, combine all raspberry glaze ingredients. Cook and stir over low heat until smooth. Place the cooled cake on a serving plate or cake stand. 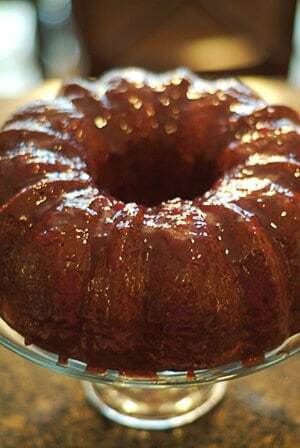 Brush the raspberry glaze over the cake and let it stand for 10 minutes or until the glaze is set. Place the cocoa in a small saucepan. Stir in the cream and butter until smooth. Cook, stirring, over low heat for 2 minutes or until thickened. Remove from heat and stir in confectioner’s sugar and vanilla until smooth and the sugar is completely incorporated. Cool slightly. Drizzle over cake. Let stand until set. Garnish with sweetened whipped cream and mixed fresh berries, if desired. In a large bowl, combine the first seven ingredients. Beat on low speed for 30 seconds. Increase mixer speed to medium and continue beating for 2 minutes. 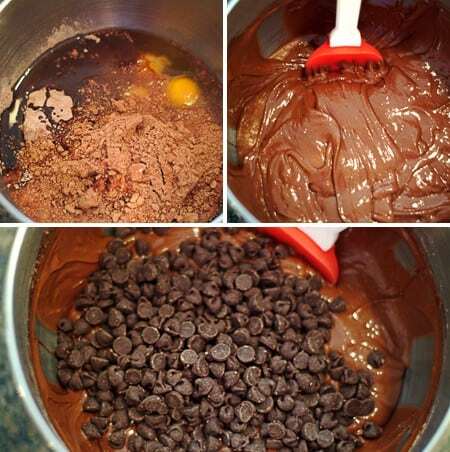 Stir in chocolate chips. 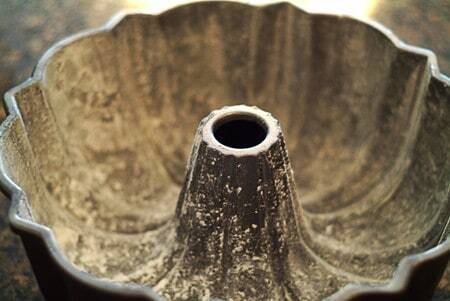 Pour batter into a greased and floured fluted tube pan. 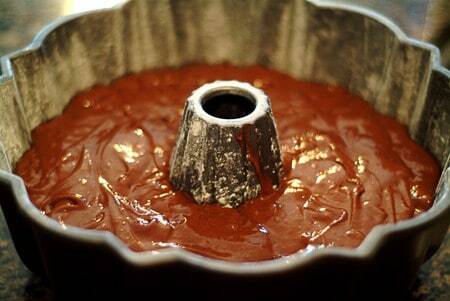 Bake for 45-50 minutes or until a tester inserted near the center comes out clean. Cool in pan for 10 minutes. Turn cake out on a wire rack to cool completely. In a small saucepan, combine all raspberry glaze ingredients. Cook and stir over low heat until smooth. Brush over cake and let stand for 10 minutes or until set. 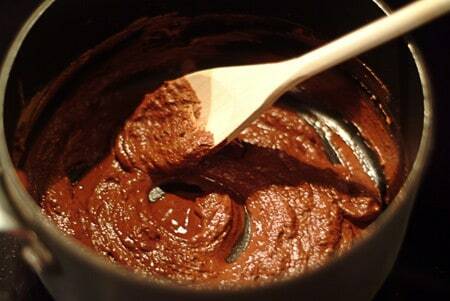 Place the cocoa in a small saucepan. Stir in cream and butter until smooth. Cook, stirring, over low heat for 2 minutes or until thickened. Remove from heat and stir in confectioner’s sugar and vanilla until smooth and the sugar is completely incorporated. Cool slightly. Drizzle over cake. Let stand until set. 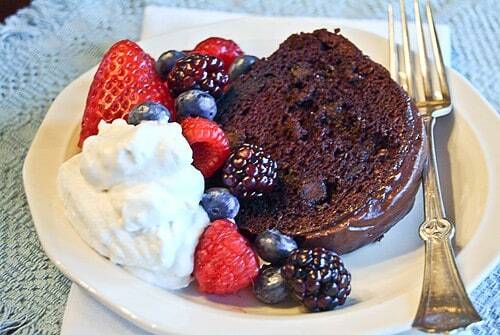 Serve with sweetened whipped cream and mixed fresh berries. Recipe from Taste of Home's Comfort Food. —Recipe from Taste of Home Comfort Food. Wow that looks so moist and chewy. I don’t mind using the box mixes. As long as I get a cake like that I’ll be happy. I love the glaze, too. BeeBop sounds like The Professor in the sweet department! I can’t show this to him or I’ll be heading to the store . . . Happy Birthday to you, Happy Birthday to you, Happy Birthday Awesome Bee-Bop, Happy Birthday to you! Even if it is a tad late. Hey Miss P! Thanks for the B’day wishes. The cake was wonderful! I always do the same with my family! This year one of my daughters asked for pumpkin pie! Luckily her birthday is in Jan so I had tins leftover. This looks delicious though and relatively easy! Just fabulous looking, Lana! Beautiful photos too. You won’t get any complaints from me. 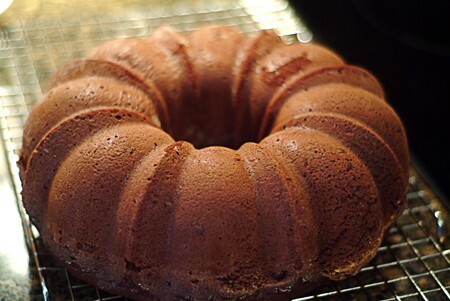 I almost always use boxed cake mixes, especially for chocolate cakes. I’ve yet to find the perfect chocolate cake from scratch recipe. I’ve been through so many that were good, but never great. Although, I have yet to try one that the Barefoot Contessa made. It was a wedding anniversary show she did where she made a replica of her wedding cake for Jeffrey (her husband). It was choclate with a homemade chocolate icing, and I’m still determined to try it. 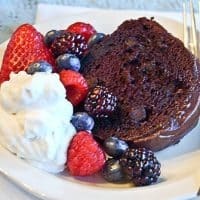 This is similar to my Mega Chocolate Cake recipe that I have posted on my site, but different as well. Mine had no icing, apple juice, rum extract or raspberry, but I think the next time I make it I may try it with your choclate icing. I normally use Almond Extract in my bundt cake, but I’m tempted to try the rum. I’m also tempted to try peppermint extract if I use your icing idea. Chocolate and peppermint to me are heaven. WoW! That is some cake! I love ALL the ingredients and layers of yumminess between the delicious cake (made with a simple cake mix, apple juice and rum extract…fascinatingly yummy) and then the raspberry glaze all topped off with a gorgeous chocolate frosting….SO yummy! I won’t be able to stop thinking of this cake until I make it! Hi Avril – Yes, that is actually a really fabulous cake even though it does use a mix. You should try it! Amazing pictures!! They really make me want to make this cake tonight! You should consider entering this cake into Recipe4Living’s 5th Birthday Recipe Contest! The site is turning 5 years old, and we’re giving away a Scharffen Berger gift basket to the top birthday cake that’s submitted!